Richard Thompson has something of a reputation as a perfectionist, and this trait caused him, a couple of years back, to review his available acoustic recordings with a critical ear. Mostly consisting of acoustic spots or complete solo acoustic concerts there was a lot of material available, but perhaps they weren’t the very finest recordings – not perfect presentations of band songs reconfigured for just one guitar and voice. Although the acoustic bonus disc for Dream Attic had already shown the way, the resolution of this problem for the back catalogue was 2014’s Acoustic Classics – studio recordings with an excellent sound quality which gave a new way of listening to well know songs. It, quite rightly, attracted a slew of positive reviews. Simply put Acoustic Classics II, as the astute reader may have already guessed, is more of the same. There’s a generous selection of fourteen songs on Acoustic Classics II, and again these are taken from across Thompson’s career – Jet Plane in a rocking chair and the aching beauty of A heart needs a home from the Richard and Linda years, several Fairport Convention tunes including Genesis Hall and a haunting Meet on the ledge as well as solo album material such as the still devastating Gethsemane. It’s an abundance of riches, of which the finest might well be Crazy man Michael – the guitar here is so elegant, and Richard Thompson unravels the tragic story with a perfectly balanced vocal. It’s hard to credit that Thompson wrote this song (with the late Dave Swarbrick) when he was just nineteen; there’s such an assurance to the writing and the memorable imagery captured within apparent lyrical simplicity: “Your future, your future I would tell to you / the future you often have asked me” taunts the raven before predicting the death of Michael’s true love. And Michael’s reaction ? “Michael he ranted and Michael he raved and he beat at the four winds with his fists oh / he laughed and he cried and he shouted and he swore / for his mad mind had trapped him with a kiss oh”. It always produces a shiver – and this acoustic version no less achieves this. Richard Thompson is the gift that just keeps giving – without a truly bad album to his name it’s just a matter of deciding how excellent each release is compared to what has gone before. Acoustic Classics II is a good companion to the original album, and offers an excellent selection of songs casting a slightly wider net to draw on Fairport days. Some of the songs are a little less well known – not necessarily a bad thing – and this is something which will be further developed on the upcoming Acoustic Rareties. Naturally anyone who already has a box full of Richard Thompson albums will want to add this to their collection, but the more casual listener will find this a chest of treasures. The sound is great, Richard Thompson’s voice is strong and the playing is exemplary. Sure, this or that personal favourite song may not have been included – but there’s still plenty of time for further releases in this series, culminating, perhaps, in a huge acoustic collection. Why not? 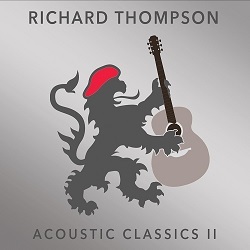 The first of two acoustic albums this year – Now That’s What I call Richard Thompson Acoustic II doesn’t disappoint.